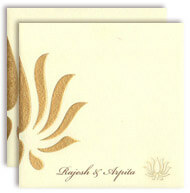 Description: Off white card with a self embossed background has a gold motif printed towards the left and a lotus shape engraved towards the bottom right. Towards the bottom centre is the space to print bride and bride groom names as an option. Inserts and envelope are made of the same off white card.